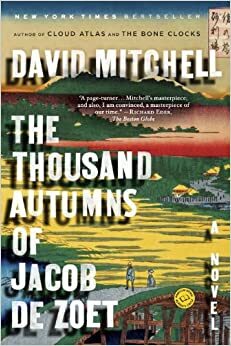 With David Mitchell's forthcoming novel, The Bone Clocks (2014), set for US release next month, it was about time I settled down and read The Thousand Autumns of Jacob de Zoet (2010). This historical novel initially seems to be a radical departure from his first four novels, though Mitchell's usual preoccupations with power, powerlessness, borders, movements (of lives, cultures, histories), languages, backgrounds, miracles, technologies, evils, and so on are all present. What makes this novel different, then? Perhaps simply the sense that it is built upon a world shaped so exactly to a pre-existing picture rather than a familiar modern world or a speculative future world to come. This may not be an accurate assessment, but The Thousand Autumns is nevertheless a novel that revels in research and thus risks disappointing readers who are resistant to the quotidian details and intrigues of a history and culture that may initially seem so unrelated to their own. Then again, isn't this task (imagining some sort of relation to difference) identical to the readerly task in speculative and/or experimental fiction? I am not entirely sure what to make of moments such as these, especially a scene framed by unattributed lyricism. Sometimes they intimate a drama of the non-human in concert with the effects of the human (the cow's reaction to the fireworks, for instance). Sometimes they relate a detail that the characters themselves notice. Sometimes they draw our readerly eyes away from a tense moment and counter-focalize the narrative (if even for just one sentence) on something entirely unrelated (though perhaps it is thematically or philosophically or symbolically related). If these sentences seem to do so many things, is it possible to make a general observation about what they do or what they want? I am constantly fascinated by the balance in Mitchell's novels between the risk of sentimentality and the bleak ontology behind all the details, relationships, victories, defeats, and struggles that populate the action of his novels. He is a novelist who takes such great care to invest us in the lives of his characters before drawing a line through them, taking advantage of their (and our) precarity by centering the action around a different character, by killing an earlier focalizer, or by making a radical shift in time and place away from the current development of theme and plot. In short, he is a writer who offers us the escape and comfort of a writing that often borders on literary melodrama but who also wrests that escape or comfort away from us again and again. (This tendency is precisely why I found the adaptation of Cloud Atlas so disappointing.) Perhaps the narrative pattern of following the senses toward something outside of the narrative action is a way not only of setting a mood but also of reminding us that the matters that matter so very much to the naive, sentimental, and progressive (even if Orientalist) Jacob de Zoet do not matter when we take a broader, ecological, historical, global, or cosmic view of things. So why all this narrative space for Jacob? Why present "The Thousand Autumns"—the experience of Japan—through him (and a handful of others)? Perhaps I'll take up this question up another time.